This blog has long been looked to as a source of amazing culinary inspiration. So here's some for you: take all of last night's dinner and cram it together in between some bread for a tasty sandwich! 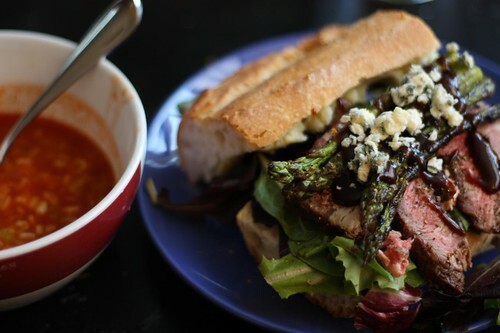 I sliced some baguette, lined it with baby greens, then topped with sliced ribeye, Wochestershire glaze, grilled asparagus, and blue cheese. I even took the leftover mashed potatoes and spread them on the top piece of bread. I don't really like to toot my own horn but this was pretty good and, as previously stated, a stroke of culinary genius. I also made a small pot of pseudo-Minnestrone and Had a little with my sandwich while Jen had the remainder with some bread and butter. Since she's still unable to taste she is merely eating foods for their texture. She said that the texture of tonight's meal was pleasing. 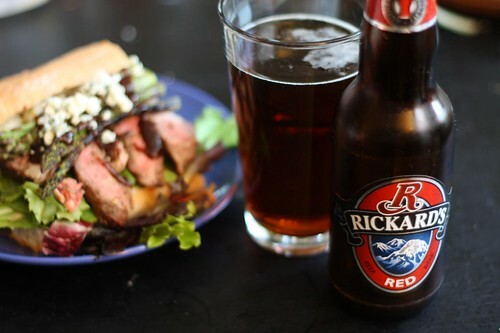 For beer I had a Rickard's Red, the latest in the dozen or so beers we brought home from Montreal. It turns out that on their website they even offer a recipe for Rickard's Prime Rib so it turns out it was the perfect pairing. There are a lot of beer recipes on their site, however, the only way you can view the site is to lie and say you're from Canada. I told them I was born in 1945 and that I was from British Columbia in order to view that recipe. I'll stick to drinking their beer rather than cooking with it. However, I will continue to lie about living in Canada and being a baby boomer.